Famous people born on March 23rd could be somewhat eccentric. As an Aries they do not allow others to define who they are. They take control of most situations and sometimes, people, too. People who share this famous March 23 birthday are known to start many projects at once. When they do this, some of the projects are left unfinished. There’s no sense in telling them a lie because they will see right through it. They have little tolerance for those that lie. Because of their past, famous March 23 celebrities tend not to give away their trust or their heart to just anybody. They make sure that a person is genuine before committing to anyone. Those born on this day tend to be secretive. They have learned not to disclose business. Freedom means a lot to the famous birthdays of March 23. And they don’t want it compromised in any way. Once they feel that they have been betrayed, they usually do not let them back in. 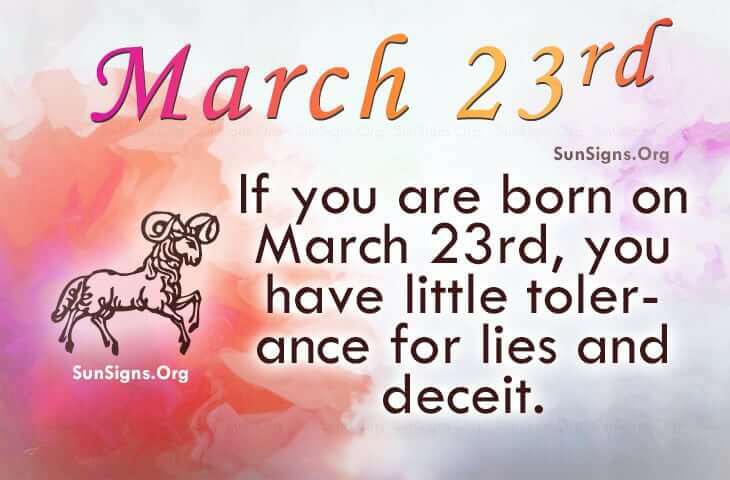 Famous people born on March 23 have a good heart but are likely to be domineering. Those you born under the zodiac sign Aries generally start things that never get finished. They are known to change their mind in a heartbeat. They, however, have little tolerance for lies and deceit.